TLJ News: April 6-10, 2014. 4/10. The Department of Justice's (DOJ) Antitrust Division and the Federal Trade Commission (FTC) released a joint statement [9 pages in PDF] titled "Antitrust Policy Statement on Sharing of Cybersecurity Information". It does not state that the sharing of cyber threat information does not violate antitrust laws. Rather, it offers an "analytical framework". This statement focuses on agreements to share information, and not agreements not to share information. However, it does suggest in just one sentence "not sharing such information as part of a conspiracy" could harm competition and therefore violate antitrust laws. The Antitrust Division issued a business review letter (BRL) back in 2000 on this topic. The just released statement states that that BRL "remains the Agencies' current analysis". Bill Baer (at right), the Assistant Attorney General in charge of the Antitrust Division, stated in a release that "With proper safeguards in place, cyber threat information sharing can occur without posing competitive concerns." Baer wrote in a separate statement that "as long as companies don't discuss competitive information such as pricing and output when sharing cybersecurity information, they're okay." This document states that "One way that private entities may defend against cyber attacks is by sharing technical cyber threat information -- such as threat signatures, indicators, and alerts -- with each other. Today, much of this sharing is taking place. Some private entities may, however, be hesitant to share cyber threat information with others, especially competitors, because they believe such sharing may raise antitrust issues." It states that agreements for cyber threat information sharing "increase the security, availability, integrity, and efficiency of our information systems. This, in turn, leads to a more secure and productive nation." And, "While it is true that certain information sharing agreements among competitors can raise competitive concerns, sharing of the cyber threat information ... is highly unlikely to lead to a reduction in competition and, consequently, would not be likely to raise antitrust concerns." The DOJ and FTC wrote that "the sharing of competitively sensitive information -- such as recent, current, and future prices, cost data, or output levels -- may facilitate price or other competitive coordination among competitors". They also wrote that they "will typically examine information sharing agreements under a rule of reason analysis, which considers the overall competitive effect of an agreement". This statement does not elaborate on what types of information sharing agreements involving cyber security might harm competition. This statement only addresses information sharing between between businesses, and does not address the many disincentives to such information sharing, other than federal antitrust laws. Deputy Attorney General James Cole (at right) wrote in another statement about two other types of information sharing that will not be affected by the just released joint policy statement. He discussed "the need for government to share information with the private sector", and the need for businesses "to share with the government". The House has passed a bill in April of 2013 that is broadly directed at promoting the sharing of cyber threat information. It is HR 624 [LOC | WW], the "Cyber Intelligence Sharing and Protection Act". The Senate has not passed it, and President Obama opposes it. 4/10. President Obama announced his intent to appoint Mostafa El-Sayed to be a member of the President’s Committee on the National Medal of Science. See, White House news office release. He is a professor of chemistry at the Georgia Institute of Technology who has specialized in nanotechnology. 4/10. The Senate Judiciary Committee (SJC) approved the nominations of Thomas Halkowski, Lydia Griggsby, and Nancy Firestone to be Judges of the U.S. Court of Federal Claims for terms of 15 years. 4/10. The American Cable Association (ACA) announced staff promotions. Ross Lieberman, who works in the ACA's Washington DC office, will become SVP of Government Affairs. Robert Shema of the Pittsburgh office will become EVP of Membership/Finance and Chief of Staff. Stacey Leech of the Pittsburgh office will become Senior Director of Meetings and Industry Affairs. Matthew Polka remains head of the ACA. See, ACA release. 4/10. The Senate Judiciary Committee (SJC) approved the nomination of Michelle Friedland to be a Judge of the U.S. Court of Appeals (9thCir). See also, story titled "Obama Nominates Pharmaceutical Attorney for 9th Circuit" in TLJ Daily E-Mail Alert No. 2,587, August 6, 2013. 4/10. Major record companies (Warner Music Group, UMG Recordings, Sony Music Entertainment and Capitol Records) filed a complaint in the U.S. District Court (EDVa) against Megaupload Limited, Vestor Limited, Kim Dotcom, Mathias Ortmann, and Bram Van Der Kolk alleging copyright infringement. 4/9. The Senate Commerce Committee (SCC) held an executive business meeting at which it amended and approved S 1925 [LOC | WW], the "Driver Privacy Act", a bill that allows court and administrative authorities to authorize access to data stored in vehicle event data recorders (EDRs). While this bill is described by its sponsors as a privacy bill, it does little to protect individual privacy. Rather, its main function is to provide for government access to data. This bill does not address driver privacy generally. It only addressed the narrow subject of EDR crash related data. Moreover, this bill does not begin to address the many issues raised by the deployment of new information technologies in motor vehicles, and the potential for collection and use of not only crash data, but also location, audio, video, communications and other data. 4/9. The Senate Commerce Committee (SCC) held an executive business meeting at which it amended and approved S 1925 [LOC | WW], the "Driver Privacy Act", a bill that allows government to access data on vehicle event data recorders (EDRs). See, amendment in the nature of a substitute approved on April 9. This bill is, at bottom, about giving prosecutors, law enforcement agencies, litigators and others easy access to EDR data. 4/9. The Senate Commerce Committee (SCC) held an executive business meeting at which it held over consideration of S 1379 [LOC | WW], the "Federal Communications Commission Consolidated Reporting Act of 2013". Sen. Dean Heller (R-NV) introduced this bill on July 29, 2013. The House passed its version of this bill, HR 2844 [LOC | WW], also titled the "Federal Communications Commission Consolidation Reporting Act of 2013", by a vote of 415-0, on September 9, 2014. See, Roll Call No. 449. See, story titled "House Passes Bill to Consolidate FCC Market Reports" in TLJ Daily E-Mail Alert No. 2,598, September 10, 2014. Sen. John Rockefeller (D-WV), the Chairman of the SCC, wrote in his opening statement that "I will note that we had planned to mark up an FCC reports bill sponsored by Senator Heller, but we still need some technical assistance from the FCC. That bill will require a few more modifications before it is ready for mark up." But, when he read his statement, this is what he said. "I will note that we had planned to mark up an FCC reports bill sponsored by Senator Heller, but that bill will require modification. That is a dangerous word, isn't it? Before it is ready to move. But surely it will be." Sen. John Thune (R-SD), the ranking Republican on the SCC, said that this bill has been postponed "until our next mark up". 4/9. The Senate confirmed Terrell McSweeney to be a Commissioner of the Federal Trade Commission (FTC) by a vote of 95-1. See, Roll Call No. 105. Sen. David Vitter (R-LA) voted no. Sen. Ted Cruz (R-TX), Sen. John Cornyn (R-TX), Sen. Tom Coburn (R-OK), and Sen. Michael Bennet (D-CO) did not vote. 4/9. The Senate confirmed Daniel Yohannes to be the U.S. Representative to the Organization for Economic Cooperation and Development (OECD). 4/9. The Senate Judiciary Committee (SJC) held a hearing titled "Examining the Comcast-Time Warner Cable Merger and the Impact on Consumers". See, opening statement of Sen. Patrick Leahy (D-VT) and opening statement of Sen. Charles Grassley (R-IA). See also, prepared testimony of David Cohen (Comcast) and Arthur Minson (Time Warner Cable), prepared testimony of Gene Kimmelman (Public Knowledge), prepared testimony of James Bosworth (Back9Network), prepared testimony of Richard Sherwin (Spot On Networks), and prepared testimony of Christopher Yoo (University of Pennsylvania law school). The House Judiciary Committee (HJC) has scheduled a related hearing for May 8, 2014. 4/9. The Department of Commerce's (DOC) Bureau of Industry and Security (BIS) published a notice in the Federal Register (FR) announces, describes, recites, and requests comments on, its proposed rules changes regarding the support documents submitted for license applications under the BIS's Export Administration Regulations (EAR) and the BIS's role in issuing documents for the Import Certificate and Delivery Verification system. The deadline to submit comments is June 9, 2014. See, FR, Vol. 79, No. 68, April 9, 2014, at Pages 19552-19564. 4/9. Hewlett Packard (HP) announced in a release "resolution" of the Department of Justice (DOJ) and Securities and Exchange Commission (SEC) investigation of its potential violations of the Foreign Corrupt Practices Act (FCPA). HP stated that it "will pay approximately $108 million to these two U.S. government agencies. HP also has agreed to undertake certain compliance, reporting and cooperation obligations." 4/8. The agendas for recent Senate Judiciary Committee (SJC) executive business meetings have listed S 1720 [LOC | WW], the "Patent Transparency and Improvements Act of 2013". However, the SJC has held over consideration of the bill. Sen. Charles Grassley (R-IA), the ranking Republican on the SJC, stated in a release on April 8 that SJC "members are working in good faith to reach an agreement that addresses concerns from the many sides of the issues. We're not there yet. Sometimes, it takes more time than we'd like, but, the end result is a better product. I'm willing to sacrifice a little time to develop a bipartisan bill that we all can support." The Senate is in recess until Monday, April 28, 2014. The SJC has not yet released an agenda for its next executive business meeting, which may be held on Thursday, May 1, 2014. S 1720 would require disclosures regarding patent ownership, and financial interests in patents, both at the filing of a lawsuit by a patent owner for patent infringement, and to the U.S. Patent and Trademark Office (USPTO). It would also provide for a stay in certain patent litigation of that portion of the action directed at customers who purchased allegedly infringing products when the manufacturer is also a party, and the "customer agrees to be bound under the principles of collateral estoppel by any issues finally decided as to the covered manufacturer". It would also amend the Patent Act to govern Section 5 of the Federal Trade Commission Act (15 U.S.C. § 45) to provide that certain bad faith demand letter practices constitute unfair or deceptive trade practices within the meaning of the FTC Act. Meanwhile, the Senate Commerce Committee (SCC) has not yet marked up the patent bill within its jurisdiction, S 2049 [LOC | WW | TLJ], the "Transparency in Assertion of Patents Act". See also, story titled "Sen. McCaskill Introduces Bill to Regulate Patent Infringement Demand Letters" in TLJ Daily E-Mail Alert No. 2,632, February 27, 2014. The House passed a major patent bill in December of 2013, HR 3309 [LOC | WW], the "Innovation Act". It contains a fee shifting provision. No Senate Committee has taken any action on that bill. 4/8. Comcast and Time Warner Cable filed with the Federal Communications Commission (FCC) a application [181 pages in PDF, redacted] for approval of their proposed merger. 4/7. The House amended and passed HR 3470 [LOC | WW], the "Taiwan Relations Act Affirmation and Naval Vessel Transfer Act of 2014", without a roll call vote, and without opposition. 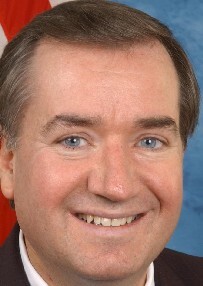 Rep. Ed Royce (R-CA) introduced this bill on November 13, 2013. The House Foreign Affairs Committee (HFAC) approved it unanimously on November 20. The Senate has not yet passed this bill. Trade and Investment. This bill contains numerous statements of policy regarding US Taiwan relations. It states that the "Congress ... reaffirms its commitment to deepen United States-Taiwan trade and investment relations as well as support for Taiwan's inclusion in bilateral and regional trade agreements at the appropriate time and under the right conditions in which outstanding issues affecting United States exports are being addressed" and "supports the strong and deepening relationship between the United States and Taiwan." Rep. Royce (at right) stated in the House that "Taiwan's participation in regional trade agreements could greatly benefit American consumers and exporters as well." Export Control Regime. The bill also makes minor changes to the US arms export regulation regime, by increasing the Congressional notification thresholds for certain foreign military and commercial sales. Rep. Gerry Connolly (D-VA) stated in the House that "The bill also will help advance the President's Export Control Reform initiative, which has long been a priority for the high-tech community which I am proud to represent in northern Virginia. I have been working with the House Foreign Affairs Committee for years to reform Federal export controls, which have stifled innovation in the American commercial defense industry and put U.S. exports at a disadvantage. Today's bill updates the process for congressional review of exports to reflect regulatory changes now being implemented by the Departments of State, Commerce, and Defense." Taiwan Relations Act. This bill states that the Congress "reaffirms its unwavering commitment to the Taiwan Relations Act as the cornerstone of relations between the United States and Taiwan". The Act was enacted in 1979. It also states that the Congress "supports the United States commitment to Taiwan's security in accord with the Taiwan Relations Act, including Taiwan's procurement of sophisticated weapons of a defensive character, such as F-16 C/Ds aircraft and diesel electric submarines". It also provides for the transfer of four guided missile frigates to Taiwan, two to Thailand, and two to Mexico. All are of a class build from the late 1970s through 1980s. Rep. George Holding (R-NC) stated in the House that "As we have seen the Chinese Government continue to escalate tensions in the region, Mr. Speaker, making certain that we enhance this security cooperation is important." Rep. Connolly said that "China's recent declaration of an Air Defense Identification Zone and subsequent provocation toward other ships in the region has raised concerns about the possibility of escalation and provocation. That makes the security posture of friends like Taiwan even more precarious and more important and underscores the need for us to continue this defense partnership." 4/7. The Senate confirmed Francis Taylor to be the Department of Homeland Security's (DHS) Under Secretary for Intelligence and Analysis. 4/7. The Senate confirmed Reginald Brothers to be the Department of Homeland Security's (DHS) Under Secretary for Science and Technology. 4/7. President Obama nominated Gordon Tanner to be General Counsel of the Department of the Air Force. See, White House news office release. 4/7. World Trade Organization (WTO) Director General Roberto Azevêdo gave a speech regarding Doha round negotiations. He said that "consultations have not yet produced anything very new in terms of members’ stated positions". But, he said, "we have been making good progress".